The panels at Further Confusion 2000 inspired me to start this one, though she hasn't gotten much past this phase. The mask was originally going to be another wolf, but I decided to go for a coyote instead. 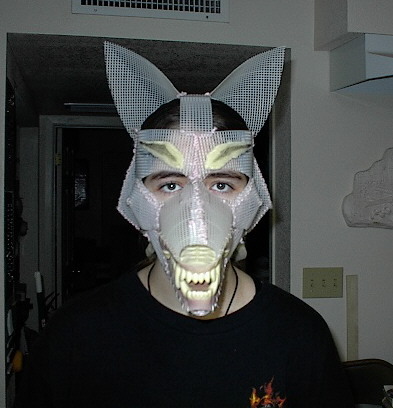 I still would like to do a coyote costume, but it remains to be seen whether this still ends up being the base for it. 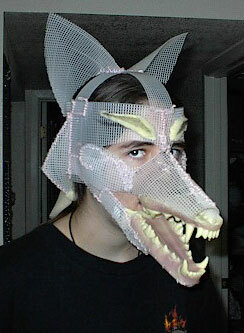 The mask is made from plastic mesh. 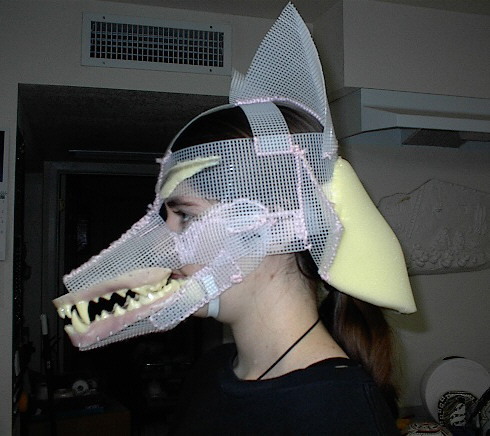 That idea, and the idea for using teeth from a taxidermy supply company, came from Big Bad Wolf's site; he says that original credit for the plastic mesh mask goes to Torrle. What bugs me is that I've used plastic mesh before for the area where I see out of the mask (since the very first mask I did, the velociraptor! ), and never hit on the idea of making the whole mask out of it! It's very light and comfortable, and more durable and easier to adjust than my previous method of cardboard and masking tape. Er... duh. You'll see in the pictures that I attached a piece of foam on the back of the mask. This is part of an attempt to make the neck a little thicker, and give it the illusion of being longer. I did something similar on the raven costume, and it worked well. The mask understructure is done, and awaiting a nose, tongue, and fur. Speaking of fur, I got an excellent tip from Banwynn (actually, about three dozen excellent tips from him, during that panel!) on where to get the fur for this one. It's from a place called Mendels — a little more expensive than the kind I've been buying, but there's a very obvious difference in quality. It's thicker, softer, and less plastic looking. Well worth looking into!